After having terrible jobs working for other people Jacob went off on his own to research and explore how work and everything we know about it is changing. Today Jacob Morgan is one of the world’s leading authorities on the future of work, employee experience, and how the workplace is changing. He is a best-selling author, keynote speaker, and futurist who advises business leaders and organizations around the world. Jacob’s work has been endorsed by the CEOs of: Cisco, T-Mobile, St. Jude Children’s Research Hospital, Schneider Electric, Best Buy, KPMG, AARP, Pandora, and many others. His latest book, The Employee Experience Advantage: How to Win the War for Talent by Giving Employees the Workspaces they Want, the Tools they Need, and a Culture They Can Celebrate” (Wiley, March 2017) analyzes over 250 global organizations to determine how to create an organization where people genuinely want, not need to show up to work. 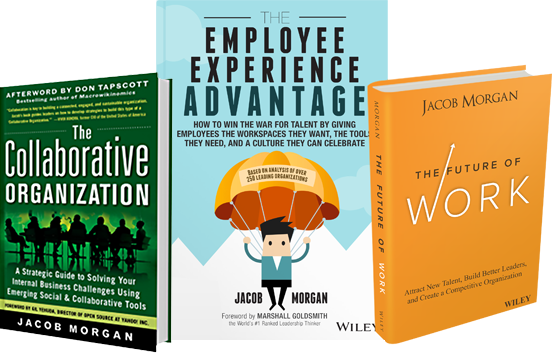 Jacob’s previous book was The Future of Work, which explored how the workplace is changing and what organizations need to do to adapt. Prior to that he wrote, The Collaborative Organization, a strategic guide for how organizations can successfully deploy social collaboration tools. Jacob’s weekly Youtube series, The Future in 5, explores the future of work in short 2-3 minute snippets. Each video is professionally shot and edited to provide an inspirational and educational perspective on how the world of work is changing. A weekly show where Jacob interviews senior executives at the world’s top organizations to find out what they are doing to adapt to the future of work. Each episode features a new guest and a explores a new topic.